Droughts, or prolonged periods without precipitation, are a huge stressor on lawns. 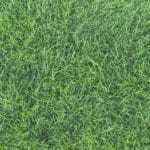 Even the lushest, greenest, healthiest lawn can fall victim to the ravages of excessively dry conditions. Once the drought has ended and you’re left with a brown, dying lawn, it’s possible to bring it back to life. Here’s how you can reclaim your green grass after a drought and the rest of the year. Droughts mean a lack of water, so it makes sense that a regular watering schedule is the best medicine for a brown lawn. 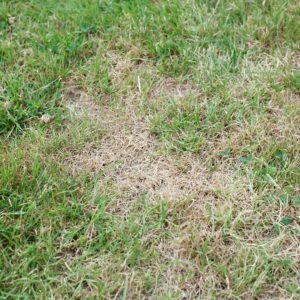 Giving your lawn a thorough soaking in the morning helps stimulate root growth and prevents evaporation as well as fungus. Aeration is the act of puncturing holes in the soil to provide the root system with direct access to water. Dethatching is the removal of thatch (organic debris). This also helps the soil absorb the water you apply. Stay on a regular mowing schedule, leaving clippings on the lawn to provide your soil and grass with moisture and nutrients. Mow on the higher side (3″ is ideal) with a sharp blade to prevent shredding the grass blades. 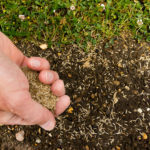 Excessive foot traffic contributes to compacted soil, which prevents grass roots from accessing the moisture they need, so try to avoid walking on drought-affected lawns. Targeting weeds with an herbicide destroys weeds while protecting your lawn. Killing weeds is important because it means your grass doesn’t have to compete with them for water, sun, and nutrients. 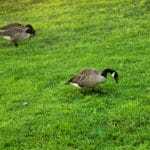 Need Help Getting Green Grass After a Drought? The experienced lawn care technicians at Green Lawn Fertilizing have seen our fair share of droughts. 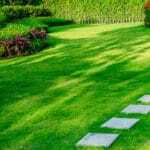 If your lawn is suffering and you’re ready for the pros to intervene, we’re knowledgeable about bringing lawns back from the dead. Contact us today online or at 888-581-5296 to schedule a free estimate and to find out how we can help!